Eric Greitens, pictured earlier this month, announced his resignation Tuesday as governor of Missouri. The Republican, who is facing an extramarital affair scandal and allegations of campaign finance violations, will step down effective Friday. After several months of bitter legal battles and political tussles, first-term Missouri Gov. Eric Greitens said Tuesday he is resigning as of Friday. 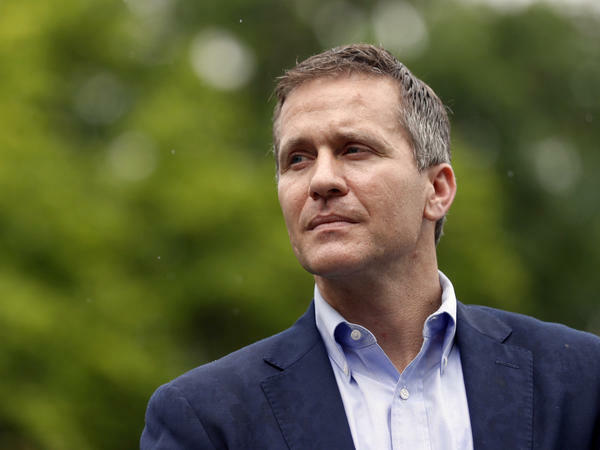 Greitens had been facing a felony charge and possible impeachment during an investigation of claims that he tried to dodge the state's campaign disclosure laws and to blackmail a former lover. "This ordeal has been designed to cause an incredible amount of strain on my family; millions of dollars of mounting legal bills, endless personal attacks designed to cause maximum damage to family and friends," he said in a statement from his Jefferson City office. Prior to taking office, Greitens had pledged to root out "corrupt career politicians," but his brief, 17-month tenure was plagued by scandal. The governor's admitted extramarital affair with his former hairdresser in 2015 made headlines just hours after his State of the State address in January. A secretly recorded conversation between the woman he'd had an affair with and her then-husband revealed claims that Greitens had taken a compromising photo of her and was threatening to release it if she told anyone about their illicit relationship. The recording was released by the woman's ex-husband without her knowledge, and it launched a criminal investigation into possible sexual assault and blackmail. That resulted in a felony invasion of privacy charge against Greitens in February. The charge was dropped, with the prosecutor suggesting that it might be restored under an independent counsel. In response to the public fallout over his affair, Greitens apologized to Missouri voters but denied allegations of coercion or wrongdoing. Eventually, the scandal also unspooled into a separate case looking into the illegal use of a charity donor list to raise campaign funds. That led to his April indictment on a felony charge of tampering with computer data. Most recently a state House investigative committee has been attempting to collect information about another nonprofit organization with close ties to Greitens. The group, called A New Missouri, was established in February 2017 by some of the governor's top political advisers. According to the Kansas City Star, the group shares the same building as Greitens' campaign committee and there is an overlap in staff. The investigative committee subpoenaed the embattled Republican on Friday, demanding he appear and testify under oath on June 4. The governor's legal team attempted to stave off the subpoena, but on Tuesday a Cole County judge ruled it could go forward. Greitens, who had consistently refused to heed calls within his own party for his resignation, announced hours later that he would give up the governor's seat.